From left, sitting: Gérald Morneault and Michel Serry, City of Edmunston councillors; Cyrille Simard, mayor of the City of Edmundston; Jacques Paul Couturier, interim president and vice-chancellor of the Université de Moncton; Madeleine Dubé, appointed vice-president of the Edmundston campus of the Université de Moncton; and Pierrette Fortin, interim vice-president of the Edmundston campus of the Université de Moncton. Standing: Éric Doiron, Éric McGuire, Charles E. Fournier, Lise C. Ouellette, Camille Roy and Éric Marquis, City of Edmundston councillors. 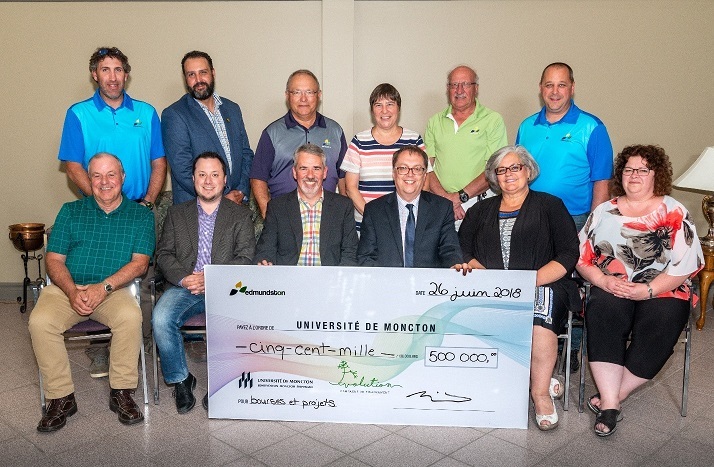 Université de Moncton is proud to recognize the major contribution of $500 000 from the City of Edmundston to its Evolution Fundraising Campaign. According to the wishes of its City Council, half of the contributions must be made in the form of scholarships and fellowships for Edmundston campus students. The other half will be used to contribute to joint initiatives, notably in the areas of entrepreneurship, innovation and economic development. This invaluable financial assistance from the City of Edmundston will support the talented and engaged youth who will build the society of tomorrow.